For the month of September my boys and I have been studying explorers. We have learned of Magellan, Balboa and all about Christopher Columbus Nationality and his voyages. I have learned many things as I read story after story to my boys. One thing that has really resonated with me as we have studied these men, is that each one went out into the unknown and tried new things relying on faith in something they believed to be there. This is much how I feel about my own homeschooling journey. It has been the hardest yet the greatest thing in my family’s life. There has been many moments where I have have learned to dig deep and trust in what I know is right for my family. I have a vision and I’m taking a step into the unknown to discover something beautiful, much like the explorers. I am grateful for all of these men that we have been studying to help deepen my own faith in my own vision. Christopher Columbus is a man that has been talked about for generations. Many great stories and some recently not so great! I have read many books on this man and find him to be pretty remarkable. Did he make some mistakes? Yes he did, but don’t we all. He is human just as you and I are, but his conviction and determination to sail the ocean blue is pretty amazing. Christopher Columbus Nationality was Italian. He was born in Italy in the seaport of Genoa in the year 1447. Many of the common people still believed the earth was flat. They believed that there was a jumping off place at the end of the ocean where giants, goblins and monsters would catch the ships and destroy them. There were few scholars who came out with the idea that the earth was round, and the idea didn’t catch on for everyone until later. #3 – As a young child Christopher Columbus told other boys that the Earth had be round. There were a lot of men who believed the earth was round, but these were educated men. As mentioned above, many of the common people still believed the earth was flat. There is a story of Christopher holding an orange, when a butterfly landed on it. As the butterfly walked up the orange Christopher watched as he saw some of his wings, and then the rest of his body appear. He realized that this is what ships do as he watched them on the horizon. The boys all laughed at him saying that this was impossible and if the earth was round that meant people in China were walking upside down on the ceiling. Christopher believed this my observing his world around him. Christopher Columbus helped with his dad in combing out wool, but he did not like to do it. He dreamed of going out on the sea to be a brave captain. #5 – In school, Christopher Columbus learned to draw maps and charts. He read lots of books which is where he learned of Pythagoras’ idea about the earth being round. He used his knowledge of map making throughout his life as he sailed the ocean blue. Growing up in Genoa, Christopher was drawn to the seaman life. He loved their stories of faraway lands and their adventures at sea. 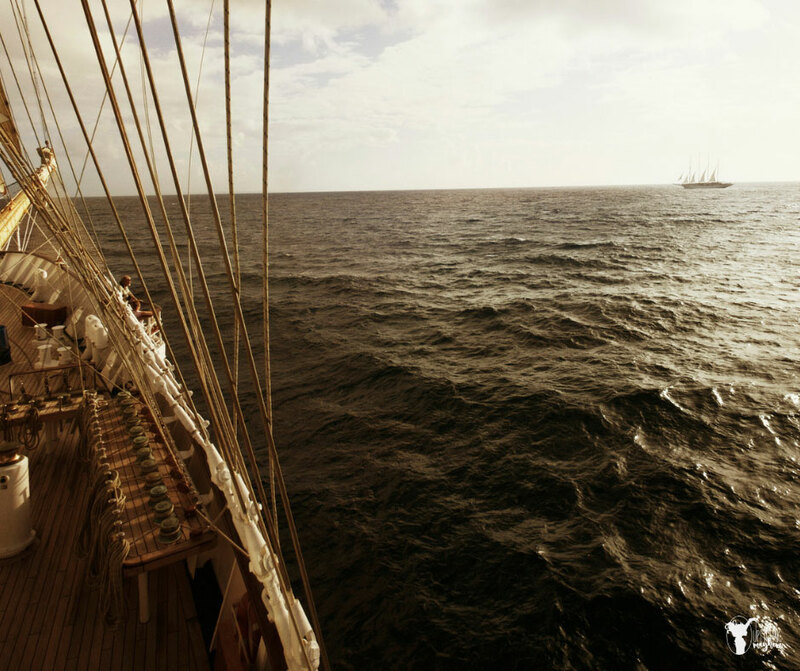 Sailors loved to tell their far off stories of things they saw and experienced. Christopher was always drawn to that as a boy. #7 – Christopher Columbus had blue eyes and reddish-blond hair. His hair turned white at the very young age of 40. Many say that as he waited and waited for someone to listen to him, he aged faster with all the stress that came with the waiting. #8 – Christopher Columbus had a ship sink to the bottom of the ocean. Most of his sailing in the beginning had been in the Mediterranean Sea. On his first voyage out to the the Atlantic Ocean to England, his ship was attacked by pirates and sunk. He was lucky as he came up to the surface of the water, he found an oar floating. He swam and floated on the oar until he reached the shore. #9 – As he heard stories of people sailing to Iceland and Greenland, Christopher’s fire to sail the Atlantic to find land burned brighter than ever. Christopher her stories of men sailing west out into the Atlantic and finding land. Christopher just knew that there must be an easier way to reach China and India, which were countries many people were drawn to with their gold buildings, fine linens and spices. 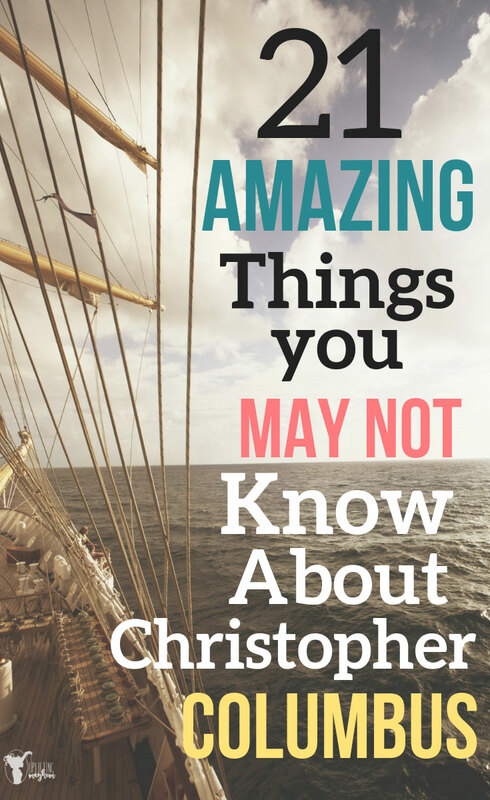 #10 – Christopher was not looking for new land or the Americas. Christopher Columbus was looking for China and India. He had heard stories of Marco Polo discovering China and India over land, and heard of all of the beautiful things that were there. Christopher, believing the earth was round was determined to find the route going West over the Atlantic Ocean to find these lands. #11 – After King of Portugal and the Kind and Queen of Spain told him no, he found himself begging for food on the street. #12 – After the war between Spain and parts of Africa, Queen Isabella finally said she would fund Christopher Columbus and his voyage. #13 – The three ships Columbus was given were the Nina, the Pinta and the Santa Maria. These ships are not like ships today. They were SMALL!! It is a little terrifying to think how small these ships were sailing across the ocean. No wonder there was lots of people who were scared and complaining. The smallest ship was the Nina at 50 feet long. The Pinta was the fastest, but the Santa Maria was the biggest at 80 ft long. It was the Santa Maria that Christopher Columbus sailed on. #14 – They passed an island that was a volcano in the middle of the ocean that was actually erupting. Many of the sailors thought this voyage would be their last and the firey dragons were going to destroy them. It just so happened that as they were sailing, they passed a volcano that was erupting. I can only imagine what was going through their minds when they passed it. The Sargrasso Sea is in the middle of the Atlantic Ocean and is a full of sea weed and sea grass. Because of the ocean currents, sea weed and see grass gets pushed in this area and stays there. Christopher, not knowing how the currents of the ocean worked, found himself in the middle of this Sargrasso Sea. This was yet another fright for the sailors as they slowly plowed their way through all of the sea grass. #16 – Christopher kept two records of his journey. One record he kept that held the true time and events of the journey. This record he kept in his room and did not show the crew. The other record he would shorten the amount of days at sea so the crew thought they were traveling for a shorter amount of time. #17 – While anchored close to an Island the Santa Maria was shipwrecked. The waters were calm, and Christopher thought all would be well when he left the wheel of the ship to the cabin boy on board. It was Christmas Eve and everyone was getting rest. The cabin boy unfortunately hit a reef and the ship became stuck. They tried their best to get it unstuck, but it ended up falling on its side and began to be torn apart by the waves, making it impossible to sail back to Spain. With the weather and waters in rough shape, Christopher was convinced they were going to sink. He wrote their story down and put it in a barrel and set it off into the ocean in hopes it will be found to let everyone know where they had been. We still don’t know what became of that barrel. #19 – Against the will of the natives, Christopher Columbus brought back 6 native men to show the King and Queen of Spain what they had found. To provide proof that Christopher found land, he brought back 6 natives to show the King and Queen of Spain. Along with the natives he brought fruits, parrots, herbs and golden ornaments. This made him a famous man in Spain and word spread to many other countries. #20 – Christopher Columbus sailed to the Americas 4 different times. After his return trip, Christopher Columbus did not have any problems getting crews to man his ships. He was well known and respected now. He sailed to the Americas four times, never finding the route to China or India. His last voyage it was difficult to find ships for the voyage. At last he was given 4 old, worm eaten ships and Christopher Columbus was off on his 4th voyage. #21 – Christopher, having studied the sky often, used the lunar eclipse to save himself and his men from hunger. On the fourth voyage, their ships being old, surviving a hurricane had now begun to take on water fast. The water was coming in faster than they could pump it out, so Christopher had to bank the broken ships on the Island of Jamaica. The natives here wouldn’t feed them or give them any food, and the crew began to suffer from hunger. Christopher, as he was studying the sky soon realized that a lunar eclipse was going to occur and used this knowledge to his advantage. He told the natives that if they did not give him and his men food then the god’s would be angry and take their moon away. That night the moon slowly grew smaller and smaller until it completely disappeared from view. Of course the natives ran to Christopher Columbus begging to have their moon returned in exchanged for food. They were saved from this island a short time later. As I have read and learned more about the life of Christopher Columbus I get the impression that he was lead by God to find the Americas when he did. There is a story of Christopher giving people and egg and asking them if they could stand it straight up and down. They tried and and tried but failed. No one dared to take that first initial journey that Columbus took, but as soon as he did, many others followed. His journey gives me hope. With guidance from above I can teach my children to rely in God in their journey as they discover the world around them. Here are some books that we read to learn about Christopher Columbus. 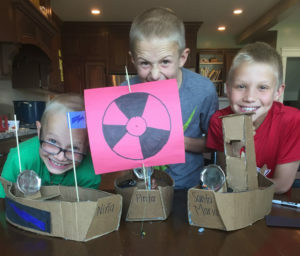 While I read many of the above stories to my boys, they built the ships Columbus sailed on for his first voyage: the Nina, Pinta and Santa Maria. They built them out of cardboard and customized each one. This activity helped engrain in their head more of the details about his voyage like which ship Columbus rode on (Santa Maria), and which one was ship wrecked (Santa Maria).